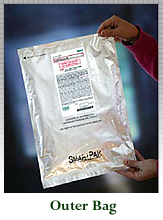 SmartPak® is composed of two sterile bags. 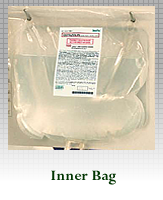 An inner bag, shown on the upper right, is in direct contact with the sterile drug product and is made of an additive-free polymer to ensure maximum stability and shelf life. Sealed double port on the bottom allows for introduction of the diluent and subsequent withdrawal of the bag contents. A labeled filled bag is placed into an outer foil bag, shown on the right. This outer bag protects the inner bag from light, moisture, and oxidation, maximizing the stability of the product.